Leaders foreign and domestic prepare goodbyes to Bush - SABC News - Breaking news, special reports, world, business, sport coverage of all South African current events. Africa's news leader. 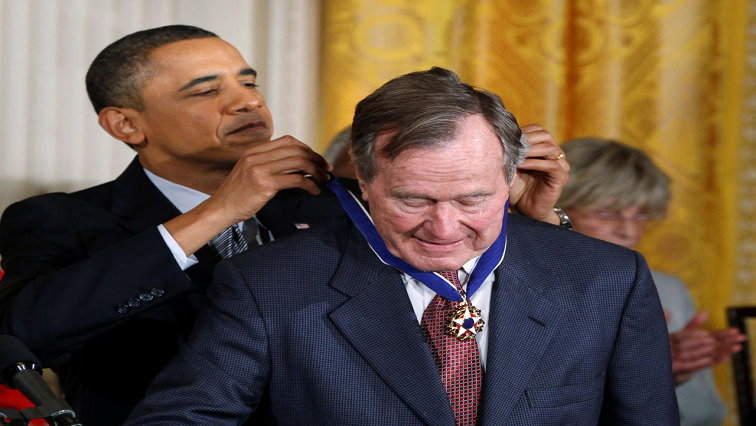 World leaders and dignitaries have started to arrive in the United States US to pay their respects to former president George H.W. Bush. International dignitaries will join US leaders present and past on Wednesday in saying their final goodbyes to former president George H.W. Bush, whose life will be honored at a funeral service in Washington. The nation’s 41st president, who died Friday at age 94, has lain in state since late Monday in the US Capitol rotunda. Tens of thousands of Americans have quietly filed in to pay their respects to a man who steered the nation through turbulent times including the end of the Cold War — and in a style dramatically different from the bombast and combativeness championed by the current commander-in-chief, Donald Trump. The country’s five living presidents — Jimmy Carter, Bill Clinton, Bush’s son George W. Bush, Barack Obama, and Trump — are scheduled to attend the service at Washington National Cathedral, the Neo-Gothic spiritual center point of the US capital. Britain’s Prince Charles will be there, as will German Chancellor Angela Merkel, King Abdullah II and Queen Rania of Jordan, and former Polish president Lech Walesa, among others. He did not attend the funeral this year of George H.W. Bush’s wife Barbara Bush, even though other presidents were there. Trump has declared Wednesday a national day of mourning. Many federal offices will be closed along with Wall Street stock markets. This entry was posted on 05 Dec 2018,02:16PM at 2:16 PM and is filed under World, News, Homepage Latest Stories Slider. You can follow any responses to this entry through the RSS 2.0 feed. Both comments and pings are currently closed.